Love these little speakers, easy to pair up using Bluetooth, took less than 1mins to pair up on my iPhone and started to use right away. Played the alphabet song on the speakers for my little son and while taking a video of the song playing, he was singing along so you might hear him singing the alphabet in the back ground (assuming he loves the device too). Really way to pair up. Easy to use and sound quality is very good, goes quite loud and best of all its waterproof so you can play your fav songs in the shower or by the poolside. 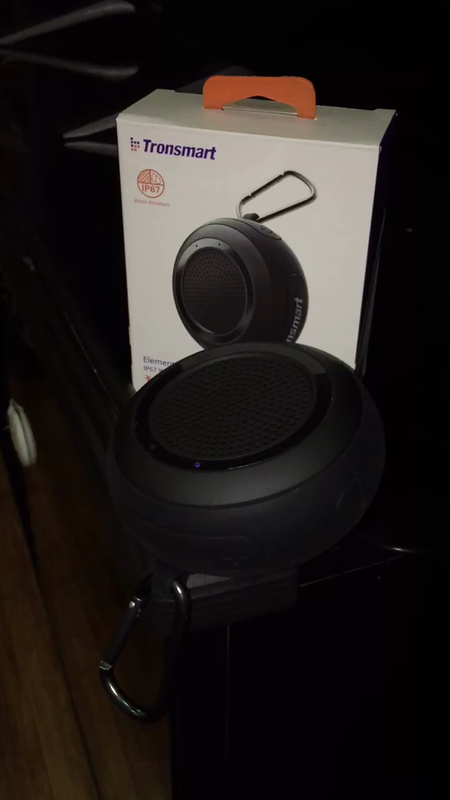 I purchased this speaker almost 2 months ago and I have been using it for less then 1 month. The speaker it self was fine at the beginning and I didnt have high expectations considering the price,although that it stop to work since a couples of days and I can't even ask for a refund..
Good Value for money. product has good sound, the bass and treble is good. the bluetooth connects instantly with no problem. I bought this to use in the shower, and also around the pool area. Better sound quality than I expected, considering the size of the speakers. Sound quality remains good, even when speakers are wet. Has been submerged in swimming pool several times now and still works perfectly - so waterproof quality seems good. Battery lasts for the full 10 hours of use, as stated by manufacturer. Feels very rugged and well made. The speaker easily connects to devices, took all of 5 secs to have it playing music . The sound quality is amazing for the size of the speaker. 5.0 out of 5 starsDead impressed! We're really impressed with this little bluetooth speaker! We bought it to go in a car we are borrowing which only has a tape player so that we could listen to music and podcasts off our phone, but also wanted something that still has use once we're done with the car and this one hit the mark! Really great sound quality and volume, especially for its size and price. Even better that you can use it to listen to music in the shower! Would definitely recommend! I had this charged quickly when I got it, paired it with my iPad, and it's been hanging in my shower since. Great sound, even with the gushing water. Don't know how I lived without bangin' club music while showering before this. I wish I had gotten a second one for the stereo function. Havent really tested how "splash proof" this item is but its quite easy to use and connects via bluetooth easily. The sound quality is decent but I was just looking for something for the bathroom to play news/youtube etc so wasnt looking for the best quality. Excellent loudspeaker. Perfect for in the shower or when travelling. Easy to connect, loud and clear sound, strong casing and minimalistic design.